With horserace coverage making the elections feel more like a game, Reuters created an actual game. As the popular narratives go, the 2016 elections are unpredictable, convention-shattering, an outsider’s game. Hey wait, you think to yourself, you’re more of an outsider than sitting senators and millionaires. Perhaps this could have been your year. “What if?” you ask yourself. A new app created by Reuters allows you to explore that counterfactual. 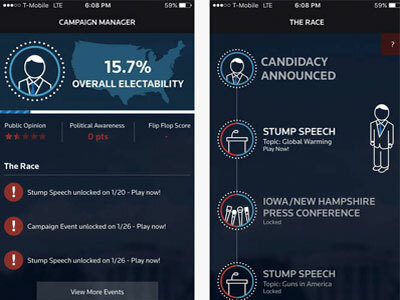 Called White House Run, the iPhone app is a game that allows users to run for president in a simulated election. Players create an avatar and decide on their candidate’s political and demographic composition and opinions on a number of electoral issues like immigration and gun control. The latter turn into “stump speeches,” which is where the polling data comes in. Candidates receive an electability rating based on how their candidate’s stump speeches translate to real Reuters/Ipsos polls. The rating is based not only on pure percentages, but take into consideration the diversity of demographic groups the candidates reach as well. “Essentially, we’re doing our best to track exactly what groups each candidate appeals to, rather than simply dividing it into ‘all Democrats’ or ‘all Republicans,'” Reuters opinion editor Jason Fields tells FishbowlDC via email. And it’s not just a one-time data dump that determines the course of the game. As the elections march on and will soon enough morph from primaries to the general, new polling data will continue to be added to the app. Since it is a game, White House Run is meant to be fun, but Fields also hopes the app can help elucidate exactly what is going on this cycle.